Nobody is going to miss this obvious change in our global experience! Planetary Change Agent Uranus digs into earthy Taurus for seven years, rocking and rolling, earth-quaking and shaking up our values and experience in the material world. Back to the basics. We are called to more deeply embody impulses from higher mind octaves, while strong plasma waves from the galactic center charge up Earth’s magnetosphere. Is Gaia evolving? Now! Are we? How? Where is your Uranus? 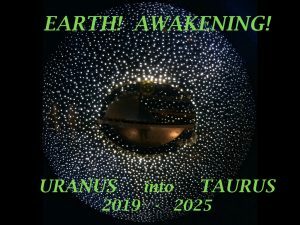 As we consider themes relevant to this new cycle, we look at how this cycle may impact the revolutionary, consciousness-awakening agenda of your particular Uranus mini-generation. We’ll also take a quick look at the impact of the Uranian sign change through the houses, for more useful information relevant to you. I look forward to gathering with of you. Sliding scale payment levels to suit your budget. The recording available soon after for all registrants. You can also register after date of webinar.